133% Super Sunday! On Sunday from 00:00GMT until 23:59 GMT, all members on their first deposit of just $/£/€30 or more will receive 133% up to 133.00. $100.00 Value Bonus! From 00:00GMT until 23:59 GMT, all members on their deposit of $/£/€10 or more will receive a 100% bonus up to 100.00 bonus. 140% BIGGER TUESDAY! From 00:00GMT until 23:59 GMT, all members are invited to receive a 140% bonus up to 240.00 on your first deposit of $/£/€ 50 or more. $100 gets $100 + 100 Free Spins!! 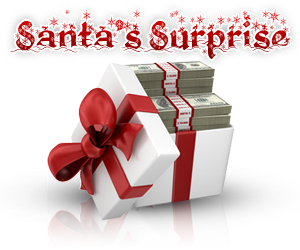 From 00:00 GMT until 23:59GMT, all members are invited to receive a 100% bonus up to $100.00, PLUS you’ll get 100 free spins on Santa Surprise on your deposit of $/£/€$100 or more. 30X wagering requirement on Free Spins winnings. Friday Special! From 00:00 GMT until 23:59GMT, all members are invited to receive a $/£/€60.00 bonus on your deposits of $/£/€40.00 or more made. Claim it 2X!